The holidays are a time for getting together with the people you love and for celebrating all the joys in your life. But it is easy to get caught up in all the hectic preparations and gatherings and to forget about people who might not be as fortunate during this special season. 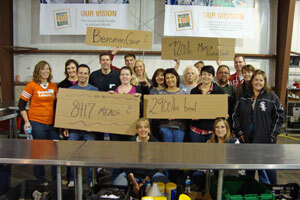 At The Bensman Group, our staff takes a day before the holiday rush begins to do something for our neighbors in need. This year, for the fifth year in a row, we spent an afternoon at the Northern Illinois Food Bank (NIFB) helping to sort and pack donations for delivery to food distribution networks across the northern part of our state. The NIFB gathers food donations from grocery stores, corporations, foundations and individuals and distributes them to more than 600 network partners, including food pantries, soup kitchens, shelters, and feeding programs for the young and the elderly across 13 counties in northern Illinois. They feed about 60,000 individuals each week. In fiscal year 2010, NIFB distributed 34.8 million pounds of food, representing about 29 million meals. On Friday, November 15, 18 Bensman team members went to the warehouse facility in Park City, Illinois, and worked sorting frozen food donations and packaging food for delivery to the pantries and other food distribution services. The team packed more than 10,000 pounds of food, which represented more than 8,400 meals. Office Manager Suzanne Kitchel and Amy Meyer, Personal Lines Manager, coordinated the effort. It was a great opportunity for the staff to get out of the office and work together in a way that we don’t usually do, and it helped to build camaraderie and encourage a sense of teamwork. But more importantly, it gave us a chance to give back. Although The Bensman Group is involved in a number of charitable efforts throughout the year, this one is always a little bit special. It has become a tradition at the holidays, and it always helps to remind us of the true meaning of this most magical time of year.